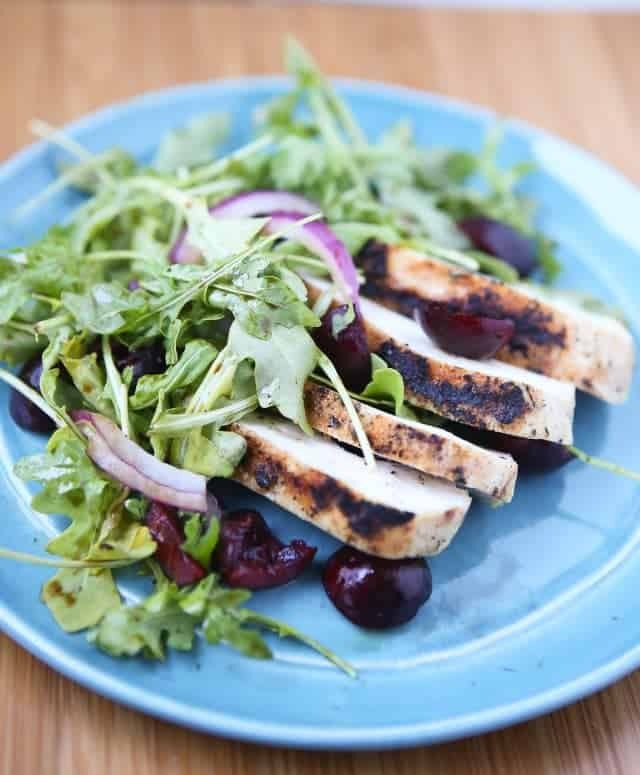 Grilled Chicken with Cherry Arugula Salad – a perfect summer meal. Light, low carb and filled with fresh flavor. Add this to your meal plan this week! No matter how hard I try, every summer I put on a few uncomfortable pounds. I tend to refer to them as the Summer 6. This year is no different than previous summers. The struggle is real people! I’m not really all too worried about it – I love ice cream and white wine in the hot summer months way too much and won’t give that up, however the excessive snacking on potato chips and other daily salty crunchies has got to go. Eating out more than a few nights a week has to stop too! The reality: summer break is over for us in just a couple of weeks (sad face) and a more structured routine is on the horizon. My discipline is much better with structure and routine so all will be well soon enough. I desperately needed to get back on track last week and make a proper meal for my family and me. I came across this recipe in my Clean Slate cookbook and its simple, straight forward ingredients were exactly what I was looking for. The best part is that I was able to grill the chicken earlier in the day when I had a few extra minutes so it was even quicker to pull together at dinner time. My daughter and I have been eating cherries like crazy so I was happy to include them in something a little different than the norm. 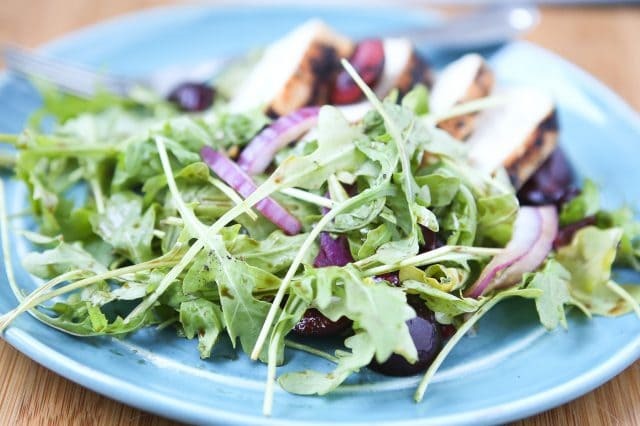 They paired up perfectly in this cherry arugula salad dressed with a little balsamic vinegar (even better – I used a cherry infused balsamic vinegar from my local olive oil shop). So so good. 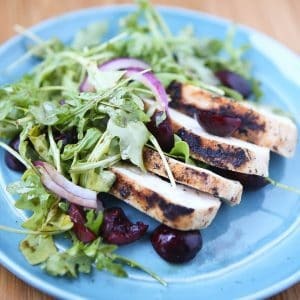 We typically eat cherries straight up but for a recipe like this, I used this cherry pitter to make salad prep a little easier. I kept it lean and clean and didn’t add any cheese, but I have a strong feeling a little goat cheese would be amazing in this dish. Heat grill (or grill pan) over medium high heat. Rub chicken with 1 tablespoon of olive oil and season liberally with salt, pepper and/or lemon pepper seasoning (if using). If you opt for lemon pepper seasoning, check the salt content and adjust the amount of salt you season with. Grill chicken until cooked through, 4-5 minutes on each side. Let rest for at least 5 minutes on a plate, covered in aluminum foil. 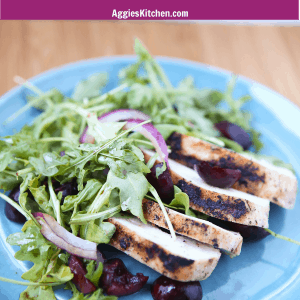 While chicken is grilling, prepare your salad. Whisk balsamic and 1 tablespoon of olive oil in a bowl. Add red onion, cherries and arugula and gently toss to combine. 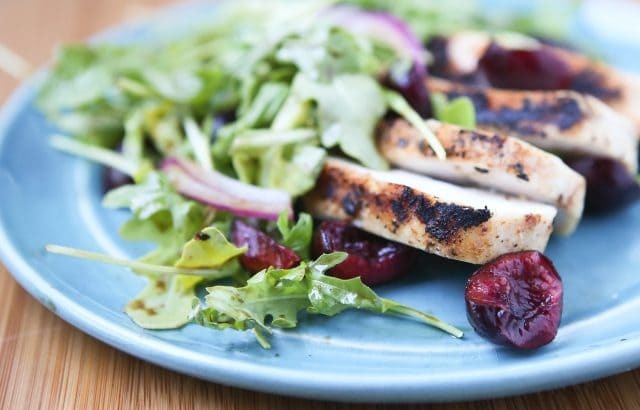 Serve your salad over sliced grilled chicken. Recipe slightly adapted from Clean Slate. Tip from Clean Slate: if you don’t have a cherry pitter, use a chef’s knife. Gently press down on each cherry with the side of the blade and remove the pit with your fingers. This is so easy…I love how easy it is…we have to make this soon!! My lunch incomplete with Salad. Thanks so much for doing the hard work and getting this recipe.